What areas do you install earthquake valves? Based out of San Jose we primarily service Santa Clara County. I can shut off my gas service to my house, why do I need an earthquake valve? An earthquake can happen at any moment. When you are at work, out shopping, even sleeping. A quick response can be the key to preventing a fire or explosion if a broken gas line is caused during an earthquake. How long does the installation of the earthquake valve take? Standard installations can typically be completed in about an hour. Do you need to shut off the gas to my house during the installation process? Yes. Your gas service will temporarily be halted during installation. However, when we turn your service back on we'll relight the pilots on your appliances. Doesn't my water heater strap serve the same safety purpose? Water heater bracing can protect it from falling over, however other unknown circumstances can cause the natural gas lines to break or leak (e.g. other items falling on the gas lines, stress on the gas lines, leaks or other breaks to other natural gas appliances). Living in the Bay Area, will small earthquakes be tripping the valve unnecessarily? No. The earthquake valve is designed to safely shut off the gas supply in larger, more dangerous earthquakes which are more likely to cause serious damage from a gas leak. Will I have to purchase and install a new earthquake valve after each 5.4+ quake? No. These devices are fully capable of being manually reset and will be ready to protect your house again during the next major earthquake. (*always contact PG&E or your local gas supplier after an earthquake to turn your gas supply back on and inspect your gas appliances for any leaks and safe operation). Can I get PG&E to install an earthquake valve for me? No. PG&E does not offer installation of earthquake valves. Does PG&E endorse any particular type of gas shut off valve? Currently PG&E does not endorse any type of valve. However, they do have strict guidelines as to how the devices are to be installed. In some cases, they will remove an earthquake valve device if it is installed incorrectly. We fully understand and adhere to all of PG&E requirements for installation. For more information from PG&E visit www.pge.com. Are there any monthly/annual fees involved with these safety valves? Absolutley not! Our one-time fee is just that. After that, you can rest assured that this device will continue to protect your home and loved ones for years to come. Are earthquake valves required by law? Some cities and counties throughout California do require the installation of an earthquake valve, and many more are heading in that direction. Requirements vary by local ordinance. Also, some insurance companies are now requiring an earthquake valve installed before issuing homeowner policies. Please call us directly at 408-365-4141, we'd love to talk with you. 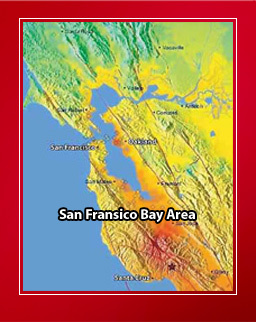 Living in the Bay Area, will small earthquakes be tripping the valve unecessarily?